My legs were aching when I woke up after yesterday’s glacier trek. I got up, had a quick shower, and chilled in the apartment going through photos and writing my blog while I snacked on cold pizza for brunch. Always tastes just as good the next day! 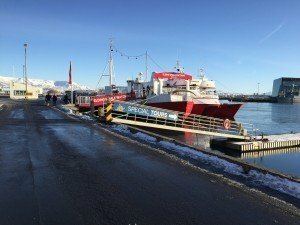 Then I headed out of my apartment and walked along to Reykjavik’s old harbour – about a twenty five minute walk. I didn’t walk along the main shopping street, as I thought I’d save that for another day. I was going whale watching – I’d missed out on it when I was in Argentina, so I was hoping I’d have better luck this time. 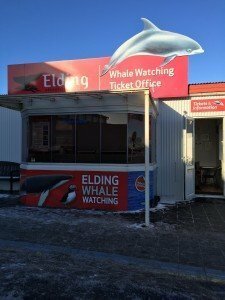 I’d booked online in advance with Elding – they seemed like they had some eco credentials, but there’s a number of other tour operators in the harbour too. I’d booked my ticket in advance online – and I’ve actually just checked how much it cost. 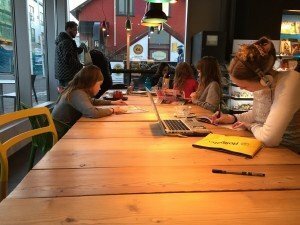 9,900 Icelandic krona, which at the time of writing is £53! That’s a lot more than I thought it was. Anyway, I headed off on to the boat, which was leaving at 1pm. It was a beautifully sunny day, but there was still a distinct chill in the air. As you got on the boat you had the choice of putting some really thick overalls on – which I decided to do, and I think it was the right decision. Once we got out to see that icy wind was again making it very, very cold. 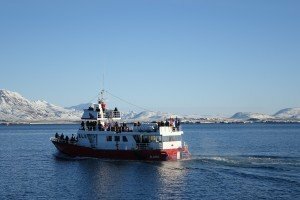 We headed out through the harbour into the Greenland Sea. There were two Elding boats – so that’s how I’ve got pics of the other one out at sea. But we did kind of take different routes. Soon we were passing some typically beautiful scenery, and the guide was pointing out points of interest over the tannoy. Then we started looking out for any sign of crustaceans. We were told we could potentially see dolphins, porpoises and whales. 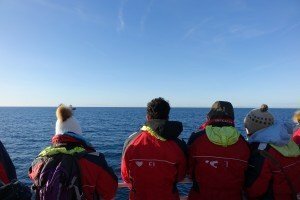 We were to look out for spurts coming from whales, and flocks of birds on the water – which would indicate their could be whale activity nearby. A pod of dolphins. It was pretty cool – and we were fairly close. They didn’t stick around for long though, and the guide explained that we weren’t going to follow them, and we’d move on so they were left alone. Then we basically sailed around looking for whales. The guide explained the different kinds we could potentially see, but they all seemed to be proving elusive on our trip. 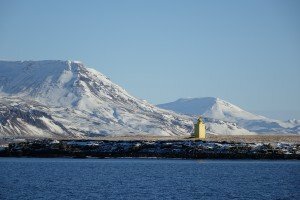 After about two and a half hours, I sensed we were turning back towards Reykjavik – and by this point to be honest I’d kind of accepted I wasn’t going to see any whales and just wanted to be somewhere indoors and warm. 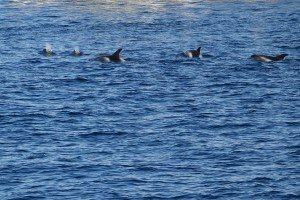 Then we turned around again – the other boat had spotted a Minke whale, so we caught up with it, and floated around for fifteen minutes – everyone just staring at the sea. No joy – the whale seemed to have moved on, and that was it, so we weren’t going to spot any whales. We sped up and headed back to town. 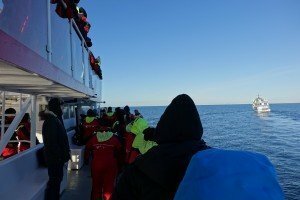 On the way back, the guide explained about whale meat – and how Iceland killed around 184 whales last year. He explained most Icelandic people don’t eat whale, and it’s really tourists that do – thinking it’s traditional. He said that if we went into a restaurant and they were serving whale, we should leave, but not before explaining why we were leaving. I thought that was a good message to be passing on. 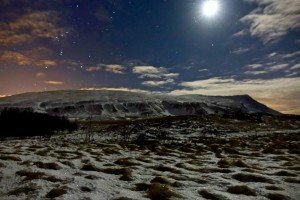 Back on dry land, I got an e-mail to say the Northern Lights tour I’d planned for the next night had been brought forward to tonight as the aurora forecast was looking good. So I decided to head back to the apartment. Not before a cheeky little hot dog though. Bæjarins Beztu Pylsur is apparently famous as having great hot dogs. Bill Clinton’s had one from the stall, and they’ve been serving them up for more than 60 years. 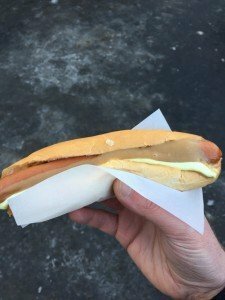 I waited in line, and handed over my 400 krona (£2.17), ordering one with everything on it. The guy was super fast, and ten seconds later my hot dog was ready. Hmmm…. I’m not gonna lie, it hit the spot after three and a half hours on a boat in the middle of the sea, but it wasn’t anything too amazing. 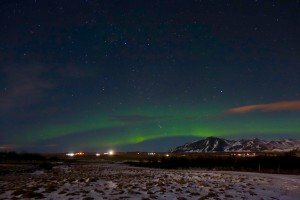 I started trudging back to the apartment, but by now I was absolutely freezing – again an icy wind seemed to be rattling through every bit of clothing I had on. I had to duck into a cafe to grab a coffee and warm up it was that cold. After warming up a bit, I got back to the apartment, had a sandwich I’d picked up earlier for dinner, and at 7.45pm promptly was picked up by my driver for the night, Davið. 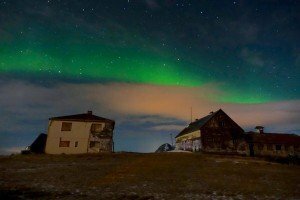 We stopped and picked up three other people from a nearby hotel, and headed to a petrol station where we met the other two cars in the group – and Bragi and Siggi, who run Artic Shots. 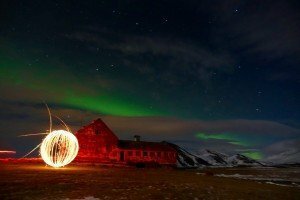 It’s a photography Northern Lights tour. It had good reviews on Trip Advisor, and in the end I did want to try and get some good photos of the lights, so that’s the tour I chose to book. I also didn’t want to end up on a coach with a busload of other people. Soon we were speeding off, our convey heading through a tunnel under the sea in search of the aurora. And there they were – the camera had caught them. As we stared into the darkness, the lights got a bit stronger, and you could actually see them with the naked eye. I was just annoyed that my focus seemed really off a lot of the time – I’d focussed on infinity, and made sure my camera was set to manual, but everything just seemed a bit soft. I’m still not sure why. After about half an hour, we all piled back into the cars, and drove off to another location. We set up our tripods, and again this time, you could see the lights – they were kind of like a faded very light grey, but the more you looked at them you could tell they weren’t just clouds. 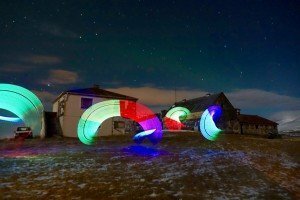 Braggi and Siggi had also brought some cool stuff along with them so we could take advantage of the long exposure needed to capture the lights. After a long time snapping, I was absolutely FREEZING. And I had on a thermal vest and long johns, a shirt, a jumper, a coat, gloves, a hat and a hood. I think most people were feeling the same as they all jumped in the cars to get a bit warm. We were handed cocoa which definitely hit the spot and warmed me up a bit! By now it was maybe about midnight, and some people in the group wanted to return home. 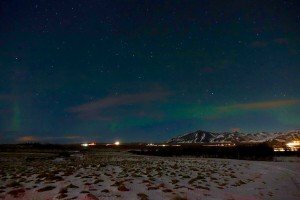 The forecast also showed that clouds were coming over the whole of the West of Iceland, so the lights weren’t going to be visible much longer. The Chinese tourists in my car had a wee baby who had slept most of the time, so as they wanted to return back to Reykjavik, I said I would too. But then I noticed the lights getting stronger, so couldn’t resist jumping out the car to get one last shot. This time, you could see the green – they just looked that much stronger. It was great seeing it. 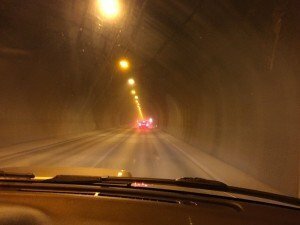 Jumping back into the car, we sped back to the city, and along the way Davið and I had a good chat about house prices in Iceland, and the effect of tourism. 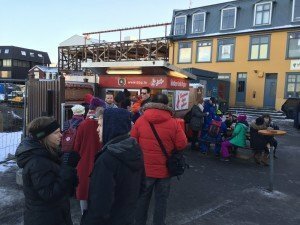 I pointed out that when you walk along the main shopping street in Reykjavik, everyone you hear seems to be American – or from some other non-Icelandic country. And he explained that’s just the way it is now, since Iceland’s economic crash made the country more affordable. You do sometimes get the sense that with all the tours, bus trips and tourism companies advertising everywhere that Iceland’s becoming a bit overwhelmed with tourists. Which kind of gave me pause for thought about the kind of things I was doing on my trip here, and the impact I was having as a tourist. 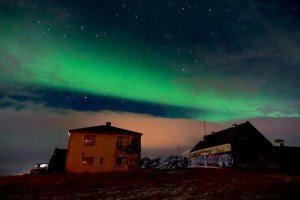 At about 1am, I was back at the apartment, shaking hands with Davið, and grateful for the opportunity to chat to a real local to get his perspective on his country. I went to bed just thinking how lucky I’d been to see the elusive lights – maybe they hadn’t been as strong as they could have been, but it was definitely an experience I won’t forget.